Chicago, IL – You know things are getting serious when you find yourself sitting with a roomful of occupiers, silently and on the edge of your seats watching the evening news. This past Sunday I attended GA at one of our most active neighborhood occupations, Occupy Rogers Park. Afterwards we went to a nearby café for some coffee, then on to an occupier’s home for more socializing. I kept nervously checking Twitter, knowing that negotiations between Chicago Public Schools and the Chicago Teachers Union were coming to a head. When we got word that press conferences had started, our hosts took a minute to figure out how to turn on their TV (it had apparently been a while) and we watched it all unfold with bated breath. Full disclosure: I am a certified teacher, currently unemployed due to severe education budget cuts that have schools firing teachers and increasing class sizes rather than hiring new ones. My father is a public school teacher in the suburbs; his mother (my grandmother) taught at CPS. This is my city’s fight, my family’s fight, my fight. My first thought that night was to head downtown immediately to join the picket line in front of CPS headquarters in the Loop. Then I remembered how little sleep I was running on, and that there were bound to be plenty of opportunities to show support in the morning. So after a flurry of social media updates and a blog post I headed home to get a few hours’ sleep. In the morning, I had about 600 picket lines to choose from. 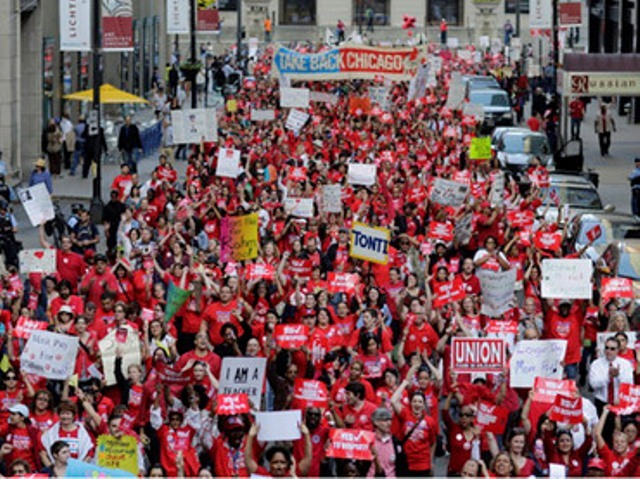 Every non-charter school had teachers in front, wearing red CTU shirts and carrying signs. The focus was on the 144 schools which remained open, providing half days of activities for students. But even the schools I visited that were closed had large crowds of strikers and supporters outside. My first stop was Amundsen High, a school on the north side. Teachers lined the entire campus in small bunches of 5 to 10 and bigger groups of 20 or more, waving at passing traffic honking in solidarity and sharing coffee and conversation. There were a few police cars on scene but CPD was more relaxed than I’ve seen them in the past year, chatting with teachers on the sidewalk. One group of students approached the school, and a teacher explained to them that there was a strike and the regular school day was cancelled. They asked if they could still get breakfast inside, and he sent them in. I know I was raised to never cross a picket line, but you can’t blame kids who have no other way to eat during the day. There is such a wide range of services provided by our schools, and it really is unconscionable that we refuse to fund them properly. Next I headed to Lane Tech, a large college prep high school. As I parked a couple blocks away, I noticed several trees draped in red ribbon and lawn signs announcing support with CTU. I also noticed two or three “red shirts” standing at each corner with on-duty crossing guards, keeping them company (since there were no students trying to cross) and eliciting plenty of honks and cheers from passing cars. There were a few hundred people on the picket line at Lane Tech. Parents with small children, teachers, and a rather vocal group of students. The students found drums and took to marching the perimeter, lively chants receiving approval and applause from teachers lining the sidewalk. CPD drove by every few minutes, blaring sirens in solidarity. It made me jump every time, because usually the police are not on my side when I’m protesting. A news helicopter hovered overhead. I spoke with a teacher and school librarian who referred to our current and recent mayors as “King Rahm,” “Richard the Second,” and “his father, Richard the First.” Their no-nonsense disapproval of politics-as-usual was entertaining and refreshing. Other teachers quizzed students on what the strike was about and why they were supporting it. Meanwhile cars pulled over and drivers gave their own messages of support. When I told people I met on the picket line that I was with Occupy Chicago, the first question was always, “Were you at the NATO protests?” They seemed impressed that I was. Some asked me about the NATO 5 cases, which I was happy to discuss, as well as my jail support work. And they all loved to find out that we have a library. I was getting ready to leave when I was stopped by another teacher who commented on my shirt (which reads: RADICAL MILITANT LIBRARIANS). He told me he’s thankful for the Occupy movement because in his 15 years teaching social studies, he’s always found it difficult to teach about economic stratification in a way that his students will respond to. “For 14 years, it just went over their heads,” he told me. Now, in the past year, Occupy has given him the language to discuss it in a way that is meaningful to his students. They understand the concept of the 99% and it’s a great tool to show economic inequality. I stopped by one final school on my way home, Mather High School, which had at least 100 people outside despite being closed. A teacher held a sign that said, “We are teaching right now.” I overheard a student say to his friend, “I would rather sit through seven hours of school than have to stand out here so our teachers can get paid.” By this point I was exhausted, and it was only 10am. So I headed home for a quick nap. What struck me about joining the picket lines was the power of having public spaces for communities to gather and discuss topics such as workers’ rights and the state of our public education system. It’s what I have spent the last year seeking out, with the help of Occupy. Want to talk about the economic crisis? Let’s meet in the financial district. Mental health clinics closing down? Meet us across the street and we’ll discuss why we need them to remain open and public. NATO bombing civilians without your consent? Time to show up outside their summit and bear witness to veterans decrying the War on Terror. We can become so insulated in today’s world. We spend so much time inside, interacting with people via electronic devices. But we must not forget the power inherent in meeting with our neighbors, face to face, and standing together to confront the challenges of our communities and world at large. In the afternoon, I took the train downtown to the rally. My train car was full of red shirts and more got on at each stop. I saw a tweet from a local mainstream media news outlet claiming that “hundreds” of teachers were converging on downtown; I tweeted them back to let them know there were hundreds on my train alone. Try tens of thousands total. Waves of red shirts getting off the train streamed toward the rally, forming informal marches that fed into the mass gathering. It was exhilarating to be in the streets with so many people, fighting for public education. There was a drum line that kept everyone stepping lively. The march moved through downtown with surprisingly little police interference. We eventually circled City Hall, chanting such gems as: “We want teachers, we want books. We want the money that Rahm took!” Students and others wrote notes with their reasons for supporting Chicago teachers and posted them along the march route. And then, far too soon, I had to leave to go to work. It was tough to pull myself away, but I knew I would be back in the streets the next day, and for however long it takes to get a fair contract. NEW HAVEN,CT – Three weeks ago I was going to kill myself. Morale at work is at an all time low earlier this year. Usually around April all the teachers are feeling “it”. The rushed nature of the school year. However, this year, we felt it on day one. Too many new initiatives. Too many new demands too soon. And pay, well, let’s just say: it is the inner city. I doubled my therapy sessions. But then I found Occupy——. And now my time is spent creating something new. It occupies my mind. I don’t think of work when I am there (unless I am there looking at student papers). I don’t think of killing myself when I am at camp. Occupy has saved my life.